I’ve spent years celebrating with my friends as they buy their dream homes. Some have purchased perfectly ready move in gems, while others have done renovations to create just the look they desired. 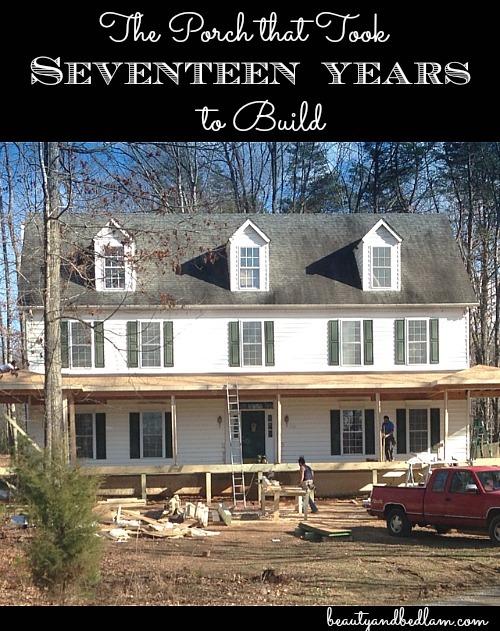 When I was a young mom with three babies ages three and under, we moved into our dream home. A dream home not because of the beautiful architectural design or the lush landscaping, far from it, but it was our dream home by choice. We decided that this was where we would build memories for years to come, welcome friends, share stories, lives and open our hearts and home to all those who came through those doors. I just never could have imagined that the thousands of people who came through our doors would enter through the side door for nearly two decades. Yes, the door that said “Welcome” came right into our always lively laundry room because our front walkway has taken that long to complete. 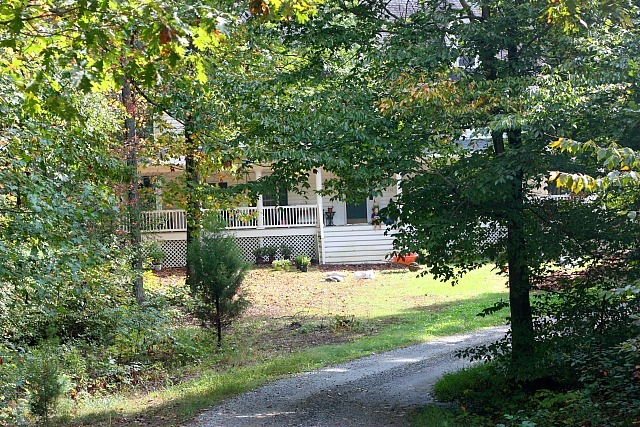 For those new to our story of creating this dream homestead of ours over the last 18 years, please take a minute and read about our Front Porch. 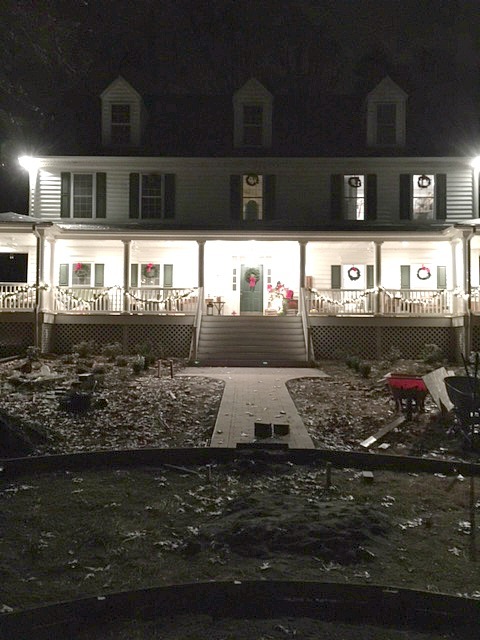 The porch shown above in the pictures was just finished last year and it’s so much more than a porch. It’s a piece of our history, our story of lessons learned, patience revealed and hope restored. Yes, all that in a little landscaping post. When you find your spot here on my blog, I want you to see real life and for most, dream homes don’t magically appear. They are a long process, so sharing my Baby Steps on this road to Southern Living Landscaping is our next step on the journey. Our front porch was completed a year and a half ago and ironically, people still come in the side door. We knew we needed to build a walkway so that people could feel the freedom to come on in the way normal people do without getting their shoes all wet and full of grass. Since we live in NC where heat and red clay are the achilles heel of planting, I hired a landscape architect to help with our design. While this was a considerable investment, she came out to our home, assessed our needs, took into consideration my favorite plants and must haves, knew our soil, our shade and sun balance etc – all those things that would have taken me months of research and drew up an amazing design for us. It was the best money we spent and for this frugal girl who always wants to find ways to save, I’ve realized that on things with lasting investment like this, do not take short cuts!! There’s a fun twist in my story because back in July I met some delightful women with Southern Living Plant Collection at a conference I spoke at. I think every one of us adores browsing the pages of Southern Living’s iconic magazine and the amazing gardens, flowers and landscapes have always been a favorite. Some of the women I spent time with are the gardeners and writers behind the landscape features that you read on a regularly basis. While I’ve been so blessed over the years to have our home nestled back in the beauty of some of the most gorgeous wooded acreage possible offsetting the lack of landscaping, it’s a dream to finally have built up our landscape nest egg to tackle this next project. For us, quality plants were an integral part of this design because after the more than 50 hours of manual labor we (ok, honestly, mainly my husband) put into this, I can’t have those plants dying come spring. 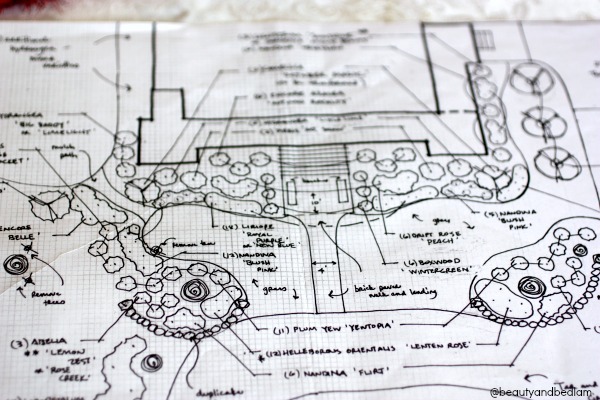 The fact that so much research has already been put into creating high end plants that will excel in Southern gardens, as well as solve common landscape challenges, that was a dream for this gardener who needs as much help as possible. 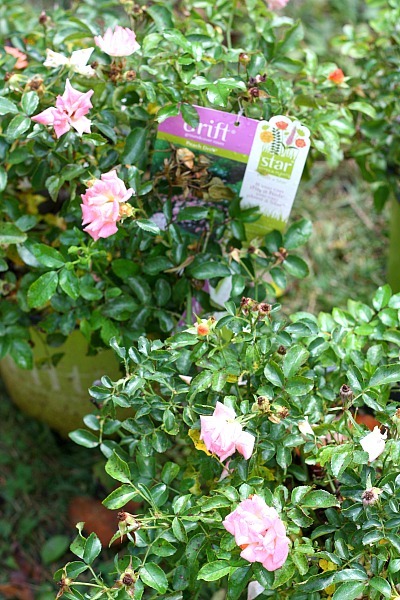 You can browse the Southern Living Plant site to see your local retailers that sell them, but I’ve found them at many of our local nurseries, as well as both Home Depot and Lowes. We knew how important it was to cultivate our soil and we put in a lot of time to make sure it was ready for planting. We knew this was a step we could not skip or scrimp on, but wow, this was incredibly hard work when all we have is rock solid red soil. We mixed it with lots of great stuff. 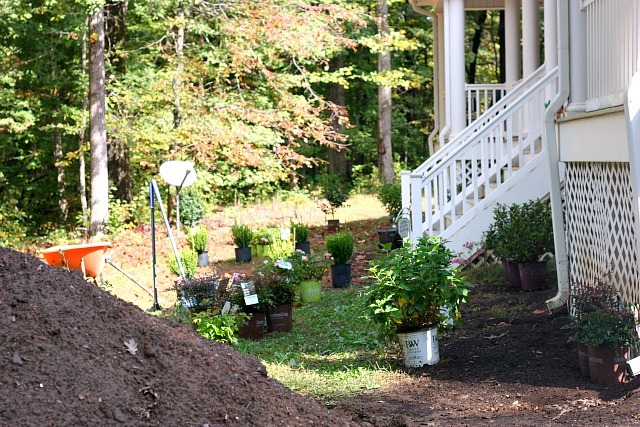 Having the design was so helpful because once the majority of the Southern Living plants came we were able to place them where we needed to dig. With over 70 plants, you can’t even imagine how long each hole took. It took us well over a month just in the digging and cultivating and by the end, it was a race against the forecast of the earliest frost warning in NC history. Of course, only when we finally are doing this ourselves would this occur – bedlam. 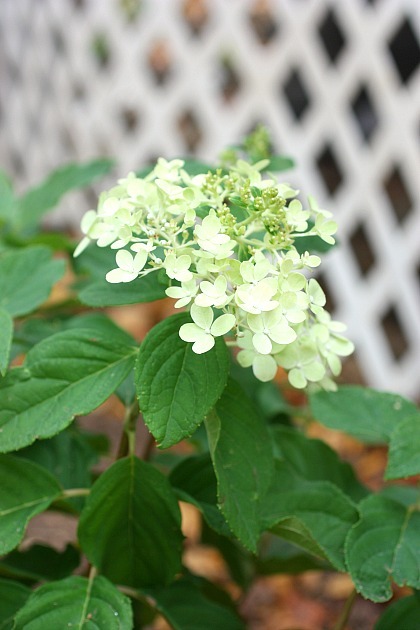 When this gorgeous Hydrangea bloomed in the beginning of November, it was a little gift from God reminding me that this perfect little peek of beauty is only the beginning of our next growing season (both literally and figuratively.) I love finding life lessons wherever I can get them. We’ve been working tirelessly on this front yard for over two months now and in the next post, after Christmas, I’ll show you where it’s at. We’ve come a long way but here’s a tiny little teaser shot. Yes, from the mouths of babes. 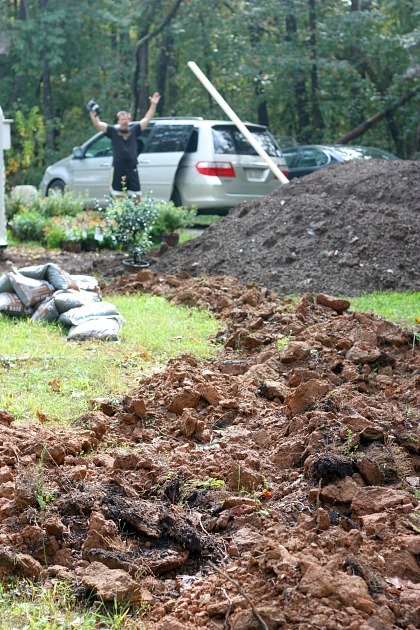 NC has had weeks of rain, so the time table for any outdoor work was pushed back. We were supposed to get our icicle lights up last week, but with the rain and moisture on the ladder, I forbade him to attempt that third story tragedy waiting to happen. 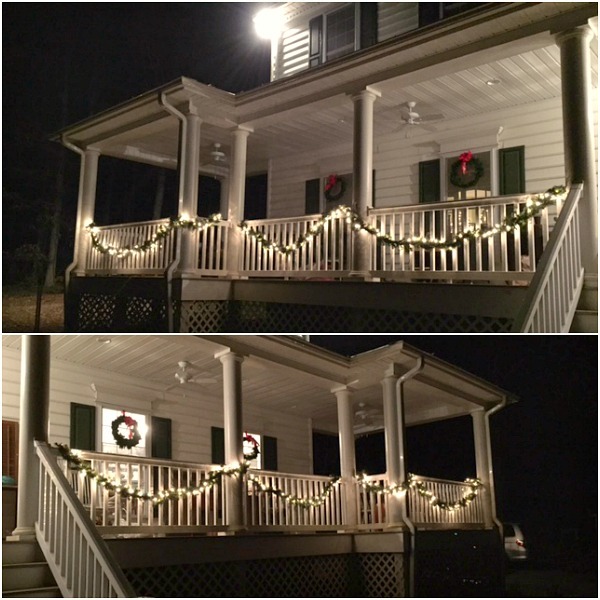 Since this was our first go around with decorating the porch, it was a trial run. 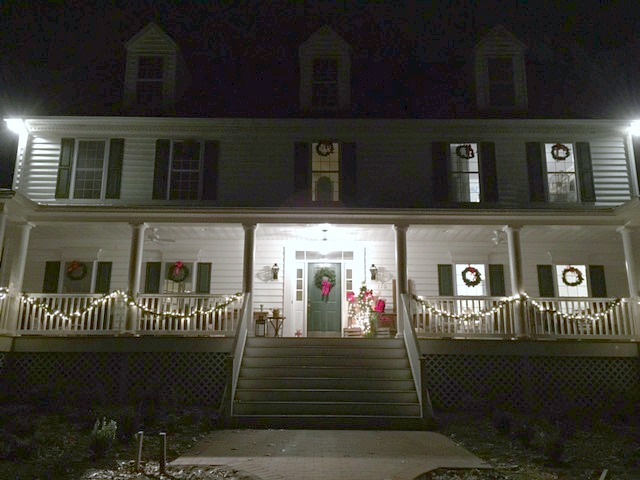 Since the front porch is so large, I realize now that I will have to double up on the garland and lights. 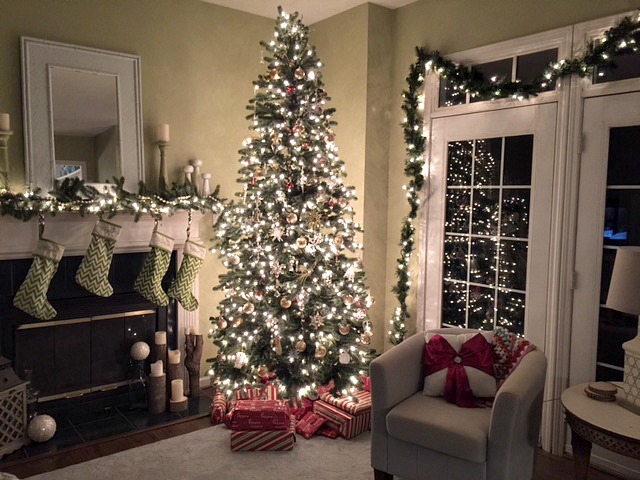 The Christmas Tree Market kindly sent me their lighted Mountain Mixed Pine Garlands, seen here, as well as the matching wreaths for our front doors. The wreaths on all the windows are ones we’ve had for years. Admittedly, they have seen their better day, especially side by side with the full Christmas Tree Market wreath. There’s just something wonderful about white lights twinkling as we pull up our drive and when my husband hangs the icicle lights (preferably before Christmas Eve since we host 40 people), hopefully I’ll have decided what to do with our main pillars – either red ribbon giving them that candy cane appearance or maybe just the white rope lights circled around them. 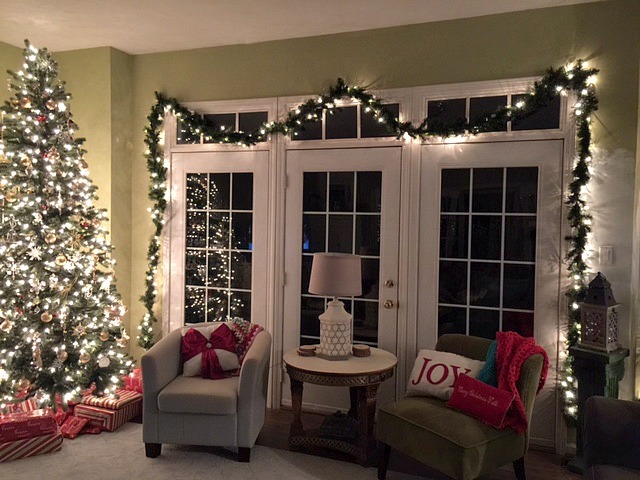 Decorating through trial and error this year, I learned something about my garland needs. When I was browsing the Christmas Tree Market site with so many wonderful choices, I didn’t even look at the amount of branch tips on the garlands or note the diameter. 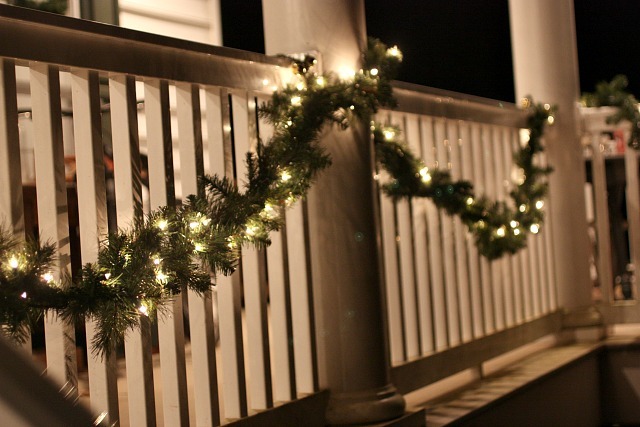 I only looked at how long the garlands were to accommodate our porch. These garlands are only 8 inches in diameter, so next year, I’ll make sure and go with something like their fir garlands which are 12 inches wide. 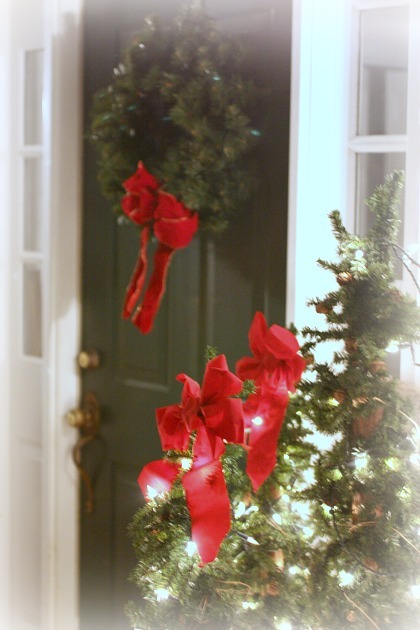 That will make a huge difference and really highlight the garland from a distance because I just adore garland on porches. And here’s where I want you to embrace your season of life. I just say NO to pinterest perfect living. Did you notice anything out of the ordinary? Or even if you look back at my walls? I’ve embraced the five different shades of paint choices on my wall and chalked it up to Monet-like style. 🙂 I even kept the laundry in the corner of the sofa for real life living sake. This is our life and we don’t want to let unrealistic realities of the internet rob us from our greatest joy this Christmas season. Thanks for taking this journey with me and if you are in a season of waiting for that “dream home,” remember you have the choice to create those dream memories right now. As always Kristina – I love seeing your comments pop up here. I’ve learned the hard way with the Cheap is expensive route and you are SO right, this was not the time to take short cuts. It will take a few years till this plan comes together but I’ll enjoy each bit. 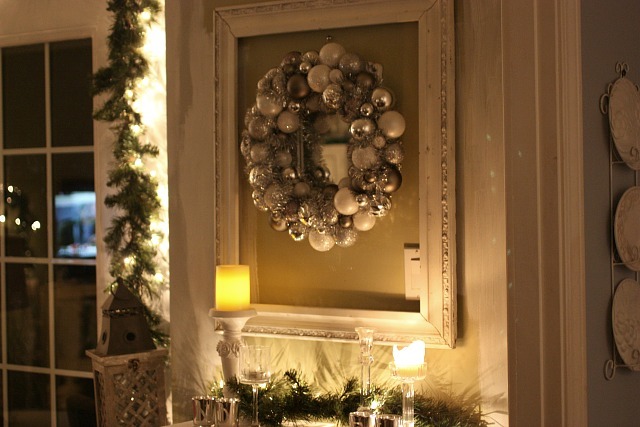 Your decorations are just beautiful. I have never commented before but always read your blog for the spiritual encouragement you deliver. Merry Christmas to you and yours and Blessings in the New Year! Oh Nancy – you just made my day. Thank you for taking the time to leave a comment. I so appreciate it. I really do. Have a blessed Christmas!! 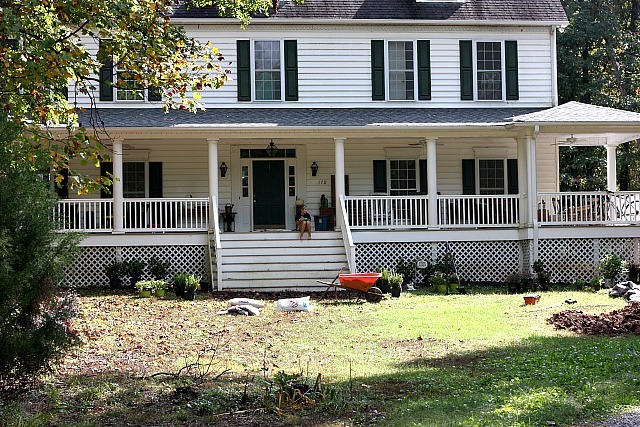 When we lived in SC for awhile, we had a big country porch and how I miss it here in NY. Now I just have your typical surburbia stoop. But I have a huge back deck. LOL! Your great room is simply gorgeous even with the unfinished paint. 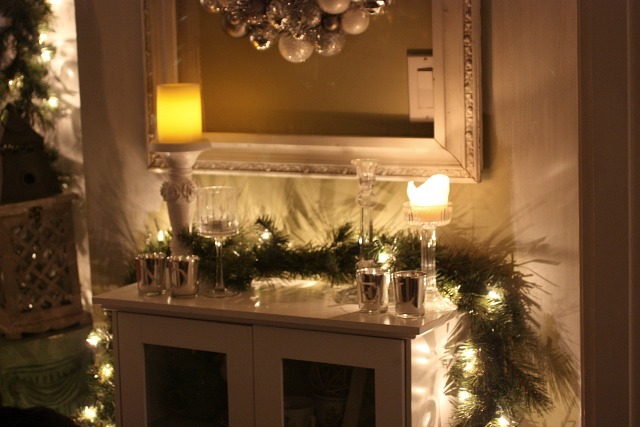 Which reminds me, I need to finish decorating inside of my house tomorrow and painting some candlesticks/holders white. Oh, that porch! It’s dreamy. I’m a northerner (PA), but there is nothing quite like a big southern porch. 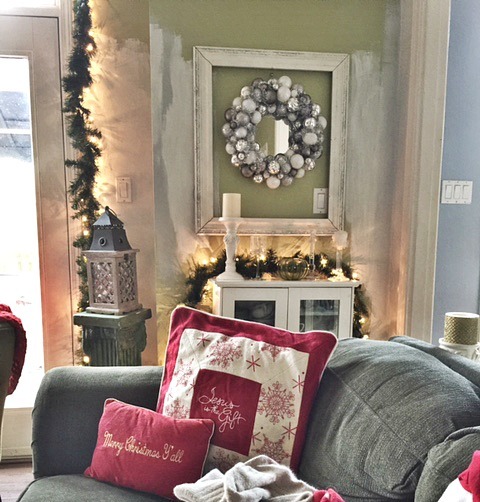 And your Christmas decor is beautiful..laundry and all. I am looking forward to more photos of the yard/ porch progression. Many blogs make it seem like we need everything done perfectly, now. I appreciate your slow, budget conscious, more realistic approach. 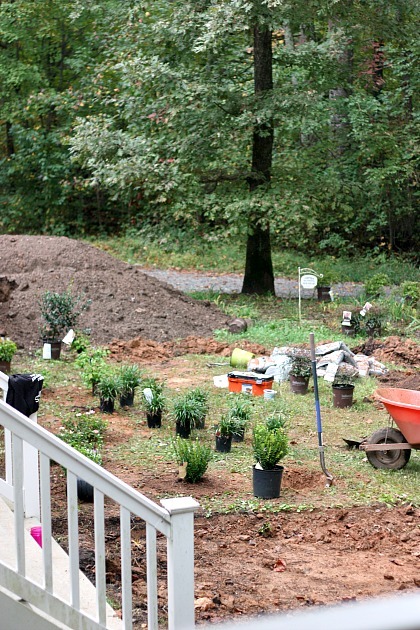 Lovely post Jen, I am so happy that your dream of a front porch and beautiful yard is finally being realized. I am only 18, but I have dreamed of having a large, beautiful front porch for years, I can only imagine how you must feel. Thank you for the message of this post, creating your dream home wherever God has put you is a message of truth that our culture of self-centered people need desperately. My family has been living in half of a partially renovated house with a yard in desperate need of TLC for a year and a half now. It’s not been easy, the cramped quarters or the feeling like we will never have a normal house. We just got real furniture a few months ago ;), but in the midst of this difficult situation God has really been teaching us how to grab the moments, the memories, and blessings of living together as a family who loves each other, despite our less than perfect circumstances. Thank you for sharing! Really, really beautiful. I live in the mountains of Idaho, far away from your front porch southern living…. so it’s dreamy for me to look at something very different from here! I love it. And what an inspiration to see how you’ve built it over time, within a budget! So great.